Ridango introduced mobile ticketing services to our customers at the time when smartphones were not widely spread. We used IVR code based messaging services at the time to provide convenient opportunity to buy tickets and top-up transit cards. 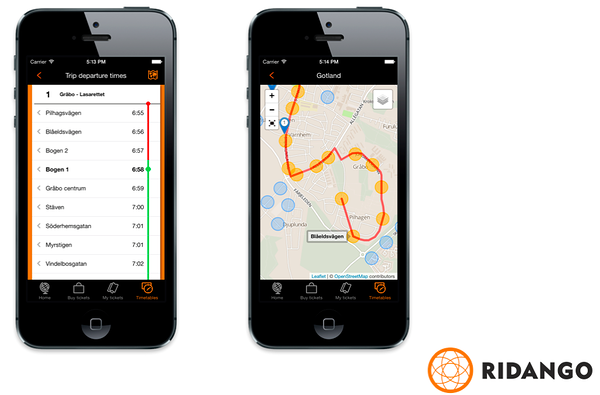 Today Ridango offers full-scale mobile ticketing solutions. We provide mobile interface for ticket purchases and card top-ups as well as for real-time journey information (see below). Ridango provides opportunity to use native application or responsive web seller interface to purchase and top-up tickets. We provide acquiring agreements for bankcard payments and turn-key solution to work for any agency or operator. Our native application has also real-time journey information and online schedules integrated into one mobile interface. All-in-one application is convenient and less confusing with different interfaces. Ridango provides also QR ticketing solution. The QR ticketing sales can be added to the mobile application to carry the ticket. Ridango has also built proprietary QR ticket reader that can be assembled on trams, light rail and buses. For metros we use standardized turnstile third party readers. Example of Ridango QR ticket reader.